Sleeveless is okay in the White House. Image via Getty. 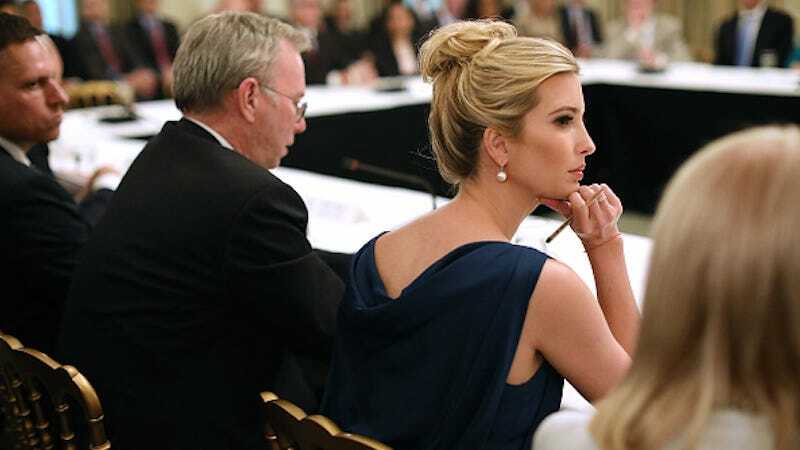 The unnamed reporter, apparently desperate to simply do her job, “ripped out pages from her notebook and stuffed them into her dress’s shoulder openings to create sleeves,” CBS reports. Her improvised outfit was still deemed unacceptable and she was turned away. At least three reporters confirmed that they had received a warning about the apparently arbitrary dress code. One report, Independent Journal Review’s Haley Byrd told CBS that she was kicked out of the Speaker’s lobby in May—the same day House Republicans passed their health care bill—for wearing a sleeveless dress. On Twitter, two reporters confirmed that either they or colleagues had been barred or warned for daring to bare their shoulders. CBS reports that the House’s dress code is largely a matter of interpretation left, in this case, to the whim of House Speaker Paul Ryan. The only written rule simply states that women should wear “appropriate attire,” and leaves the interpretation of that phrase, as well as its enforcement, to the Speaker of the House. According to Ryan, that means that women—reporters, lawmakers and staff alike—should cover their toes and well as their shoulders. Open-toed shoes, like sleeveless dresses and blouses, are both now banned in the Speaker’s lobby. Those rules do not apply to the Senate. In late June, after bringing the House to order, Ryan reminded House members to “wear appropriate business attire,” on the floor. Apparently, the coverage of women’s toes and shoulders is important business for the current House leader. If the House’s interest in women’s attire seems outmoded, then it’s worth a reminder that it’s perfectly in keeping with the concerns of the modern Republican party. During the Republican National Convention, Anna Merlan reported that a staffer lectured a woman reporter for wearing a sleeveless shirt. It really is truly something that the House wants to deny essential health benefits to women, including prenatal care, while simultaneously worrying themselves over the appropriateness of shoulders and toes. Truly, our elected leaders are complex. Correction: The original headline indicated that this policy was “new.” The headline has been updated.